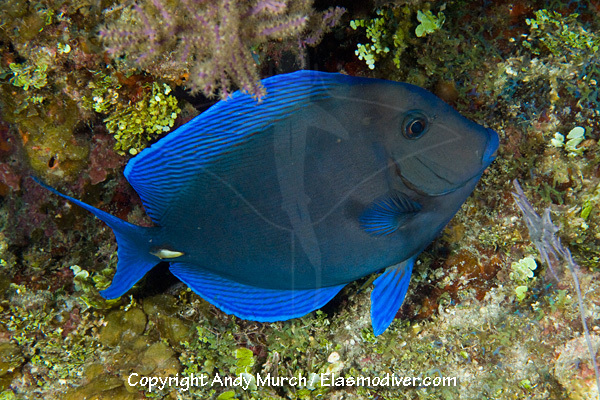 The Blue Tang (Acanthurus coeruleus) is one of the most commonly encountered surgeonfish species in the Caribbean Sea. Sometimes seen solitary, it often hunts in huge schools that move over the reef grazing on algae. These blue tang pictures are available for commercial licensing. For further information regarding usage please e-mail Elasmodiver. All of the images on elasmodiver.com are copyright protected. No unauthorized use of these blue tang pictures is permitted. Please contact Elasmodiver for further information.